I’m not sure if you’ve noticed something different in my first photo, something that I’m trying for the first time on my nail journey: to show a bit more of myself. I’m still too shy for head shots, but I’ve managed to pose my nail art hand with my outfit, sort of like NOTD & OOTD shots. I hope you like them! 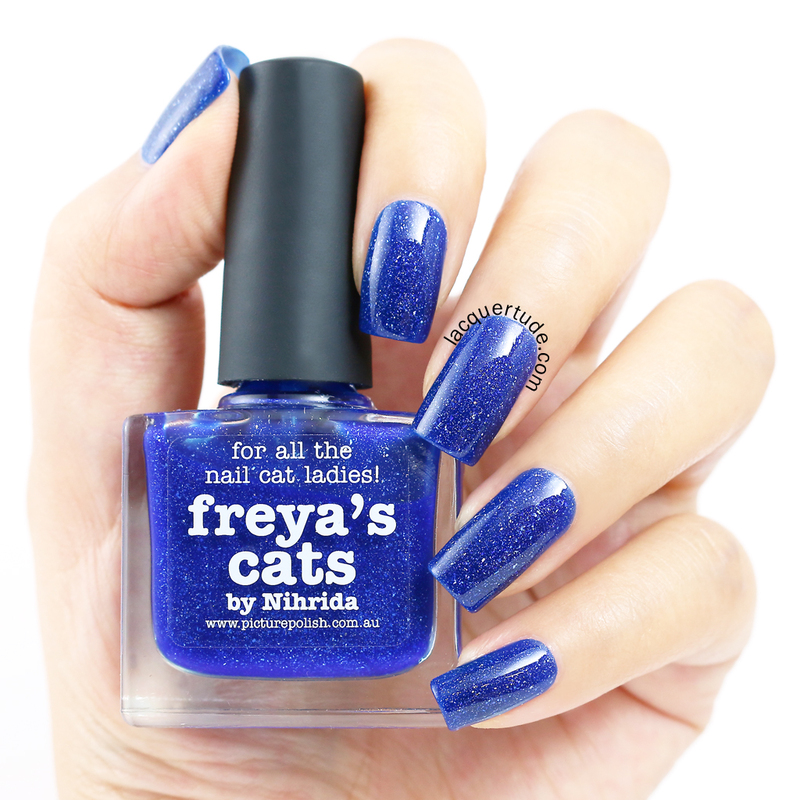 Freya’s Cats is a gorgeous, saturated, and vibrant medium blue filled with signature piCture pOlish holo particles. 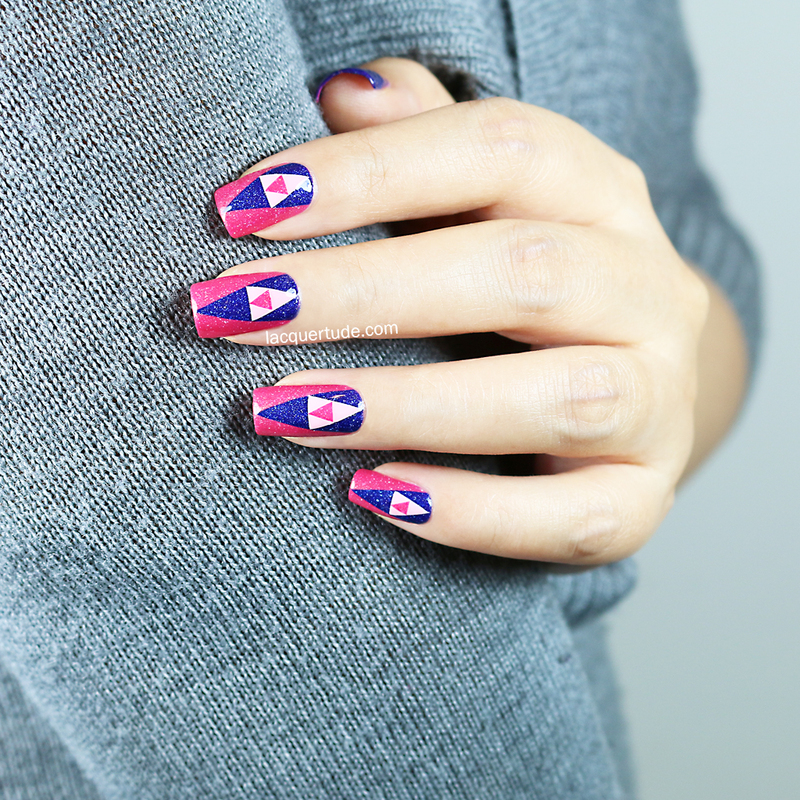 It was created in collaboration with Nihrida blog, who always has gorgeous and flawless nail swatches. Head on over to her blog to see her inspiration behind the shade and her beautiful photos. As always, Freya’s Cats has perfect formula, easily achieving full opacity in 2 coats. I couldn’t resist including this macro shot so you can see all of its gorgeousness! Electric Dream is a near neon coral pink, also filled with the same piCture pOlish holo particles as Freya’s Cats, and has an extra ingredient of golden shimmers that add to its depth and beauty. This shade was created in collaboration with Nail Polish Anon and you can see her inspiration and swatches here. Also 2 coats to full opacity and a dream to apply. 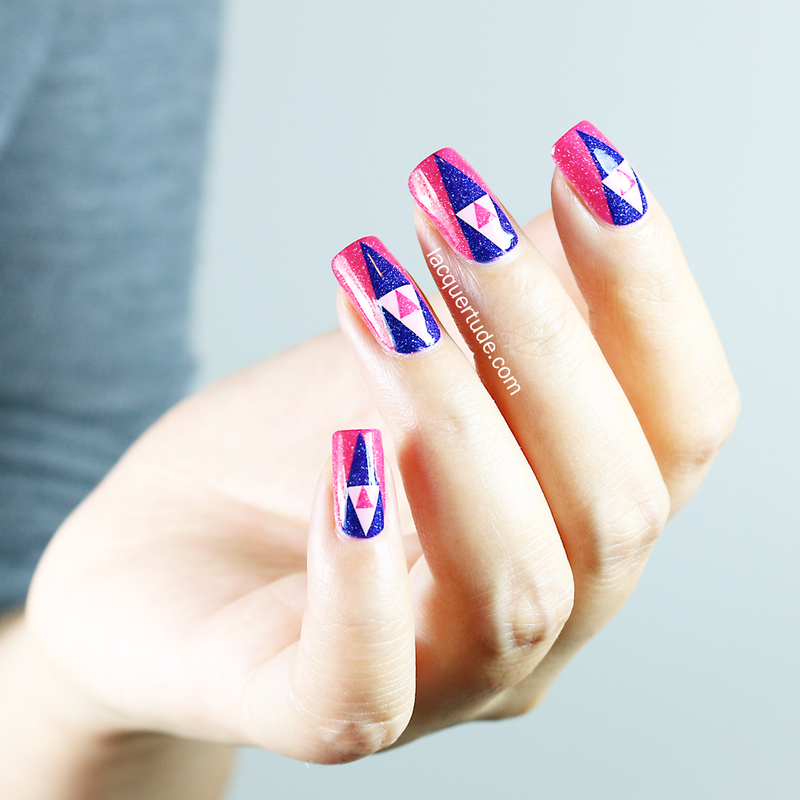 Fairy Floss was featured in yesterday’s post and nail art here. But, I’ve put the swatch here so you can see all the colors together. In this photo, you can see the most of me. I love pairing bright complementary colors such as pinks and blues with a soft shade of grey. It creates the perfect muted background for the vibrant colors to pop before your eyes. This is one of my favorite sweaters, doesn’t look like much but provides endless warmth for the cold winter days. See how much the colors and the design on my nails pop against my sweater? Larger version of the photo at the beginning of the post. So, did you like my Nested Triangles design? Have you seen it before? What do you think about my new poses for the nail art photos — should I take more like these or stick to only the hand shots? Thank you so much for reading and enjoy the rest of your weekend! You’re obviously very talented and have a great eye for pairing contrasting colors in your designs. I’m starting to do nail art myself, but I’m not sure my skills as of yet could accomplish what you achieved here. One day, hopefully so – but I know it’s definitely not today. Great job! If you managed to create a tutorial on how you did this design I’d love to see it.